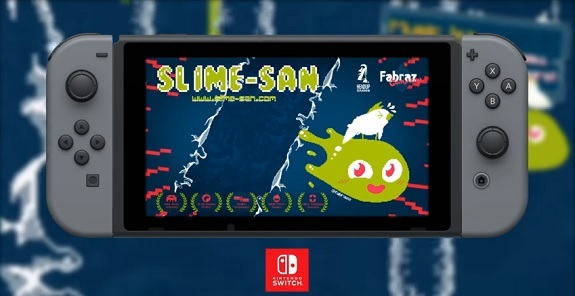 In this post, you will find all there is to know about the Software updates for Slime-san on Nintendo Switch (originally released on August 3rd 2017 in Europe and North America, October 12th 2017 in Japan). How to download updates for Slime-san for the Nintendo Switch? Leaderboards: Compete online for the best level & speedrun times! Button Mapping: Remap all of your controls to your liking! HUE Slider: Entirely change the color palette of the game! Reduce Eye Strain: An option in case the game was too harsh for you! Krazy Karting Minigame: Item based, karting madness for 2 players! Gloomy Minigame: A scary, intense FPS arena survival game! Easy Tutorial: Accessible at any time for a gameplay refresher! A brand new boss fight, can you beat the Kraken?! 10 new target mode challenges that will test your skills! 100 Bananas to collect and spend on furniture and house themes! A independent speedrunning mode to compete with in leaderboards! An entire tropical Island you can explore and discover with tons of new characters! Loads of new cutscenes and story elements to experience and enjoy! New secret characters and set-pieces to discover across your journey! New music by Mischa Perella! Loading Times: Have been shortened! Start-up Times: Have been shortened as well! Scrolling Level Performance: Has been significantly improved!